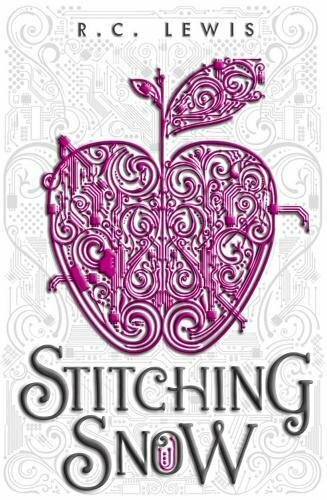 I ran across Stitching Snow by R. C. Lewis when it was suggested at one my book club meetings (and described as “Snow White meets Star Wars”–which means I’m having a Snow White-themed week on the blog…) This book wasn’t picked for our monthly read, but I decided to read it anyway. Because: fairy tale retelling! It wasn’t quite Star Wars…but it might be “Snow White meets Mockingjay,” in a good way. Sixteen-year-old Essie has been fending for herself since she was nine years old, living in a mining colony where her closest “friends” are seven drones (droids) she built herself. She trusts no one, spending her time fiddling with tech and earning extra money fighting cage matches at the bar (really!) Everything changes when a small ship crashes nearby, and Essie pulls Dane out of the wreckage. He tells her he’s on a treasure hunt–but the treasure turns out to be the missing Princess Snow, heir to the throne of the most powerful planet in the system. Essie, of course, is really Snow, and soon she’s unwillingly drawn into interplanetary politics and conflicts. But she has a choice–to be a pawn or to be a leader, to run away again from her father and stepmother, or to embrace the courage and compassion her mother tried to teach her. I really enjoyed how this twisted together bits of the Snow White story. I don’t think I’ve seen another one that started after Snow White was with the dwarfs. We learn about the previous events, and we see snatches of the familiar tale as the novel unfolds. There is a poisoned apple (sort of) and a prince and a kiss to wake someone sleeping…but possibly not who you’d expect. Essie (Snow) is a wonderfully unconventional fairy tale heroine, both in her love of coding and in her way of dealing with trauma–through fist fights. That question of trauma is where this made me think of Mockingjay, and how this book gave me what that one did not. Mockingjay disappointed me because it wasn’t a story about Katniss overcoming trauma, it was about how horrible experiences destroyed her beyond recovery. Essie has also been through hell (besides her mother’s death and her stepmother’s attempt to kill her, we also learn eventually that she was sexually abused as a child–which explains a lot about her trust issues and fears). Without minimizing the struggle, the book is about overcoming the trauma. There are missteps, steps backward and mistakes made, but she finds ways to push through the fear, or compartmentalize the horror, or take a risk and be willing to trust. And Essie steps up to help lead a rebellion while working through her own struggles. People obviously handle trauma in different ways, and I don’t want to minimize or judge anyone’s real life experience…but when choosing my fiction, I know I would much rather read about overcoming horror than about descending beneath it. And it’s a far more inspiring narrative! Essie is the biggest focus of the book, but there are some good side-characters (Dimwit, the malfunctioning drone, is some excellent comic relief, and Dane is pretty cool too), a complex but not confusing political situation (involving four different planets with their own histories and societies), and plenty of danger and tension. This in some places heavy, with a main character who really feels the trauma that most fairy tale characters probably should, but there are lighter moments and plenty of excitement too. If you like fairy tales and sci fi, and can handle some dark moments (but an ultimately hopeful direction to the story), then I highly recommend this one! Glad to know you liked this one, as I have the ARC sitting on my shelves! Will definitely move it closer to the top of the TBR list.